Overview: Starting today, Blue Mound will be the second stroke play course for this week’s U.S. Amateur at Erin Hills. I’m really interested to see what happens here. 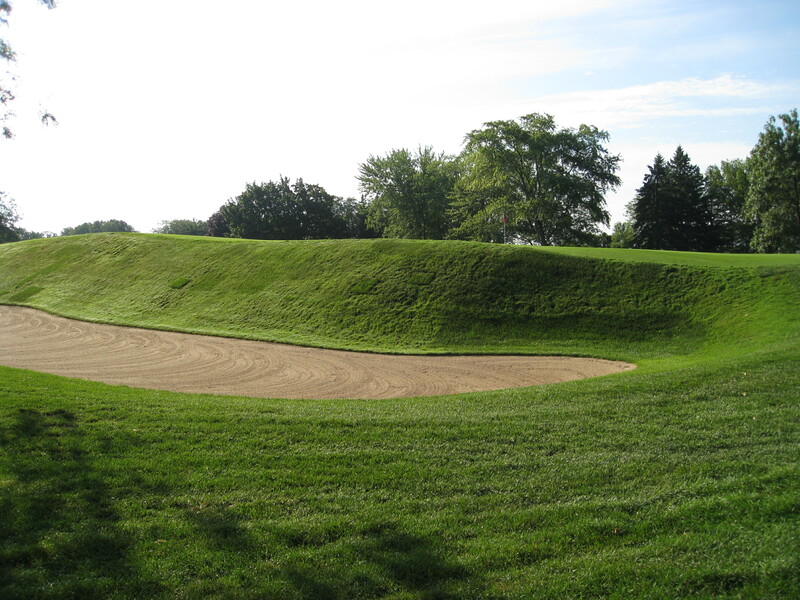 Blue Mound is a wonderful Seth Raynor course that opened in 1903. It is currently in the “next 100” on the Golfweek Classic course list. The course hosted the 1933 PGA Championship, which was won by Gene Sarazen. Blue Mound would be a wonderful place to be a member (since it is probably the closest club to Miller Park, I also like the Brewers colors in the ‘back’ flags). 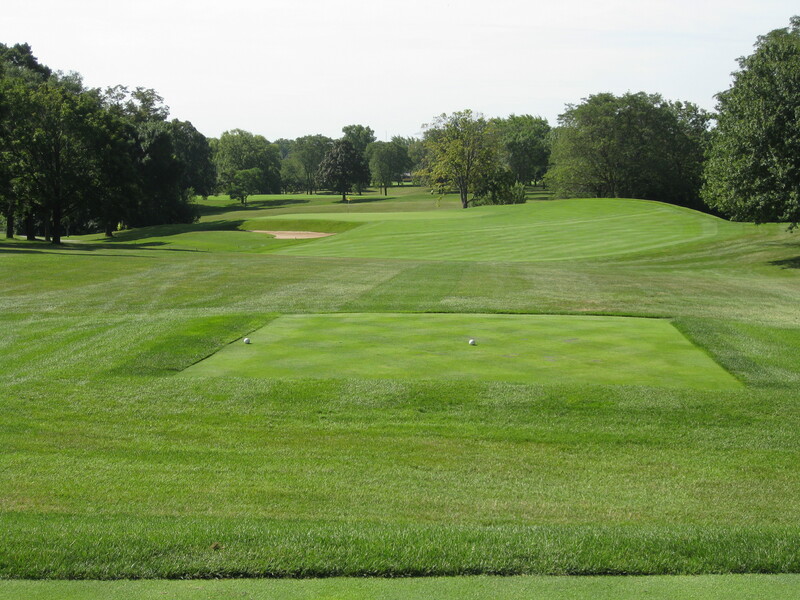 There is a great collection of Raynor template holes and wonderful green complexes. And the club has done a very admirable job restoring the course to its previous glory. There has been great work on the bunkers, greens have been expanded back to where they once were, trees have been removed. As good as it is, it was really nice to hear that the club is going to continue with tree removal over the next three years, removing another 500 or so trees in the process. Thoughts: That said, I expect there are going to be some really low scores here this week. At 6,666 and par 70, the really good amateurs — the long hitters with the college bags in particular — are going to overpower this place. There is very little trouble off of the tee and there will a lot of short irons and wedges into greens. Because of a summer filled with moisture and humidity, I’m guessing the course won’t play as firm or as fast as the club and the USGA would like. If somebody gets their wedges and putter going, I think scores in the low 60s are very possible. 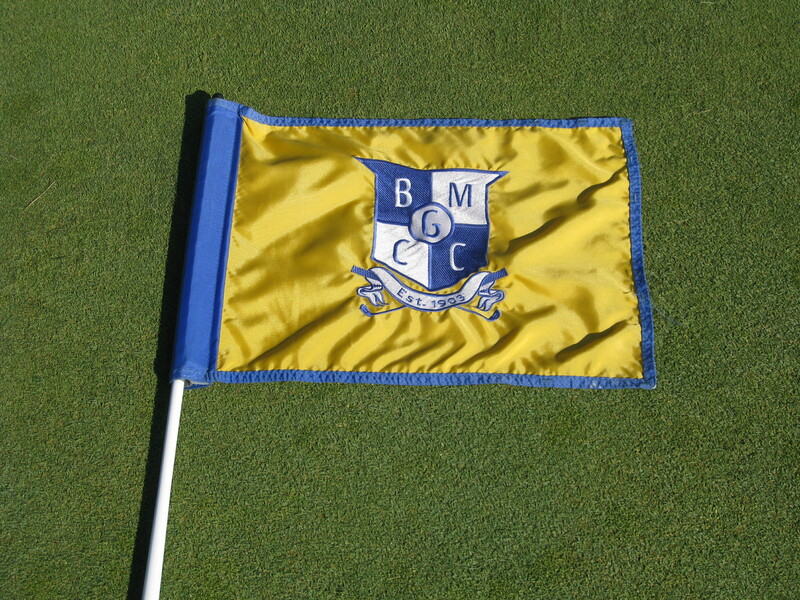 The putter is clearly the most important club in the bag if you want to have success at Blue Mound. Many of the greens have distinct shelves/quadrants/areas. Putting from one to another can be challenging and being above the hole is problematic. If you want a really good overview with about a million photos click on this thread from Golf Club Atlas. It is really well done and the author took the photos while watching the Western Junior. Here are a number of photos I took of some of the holes during my recent round. 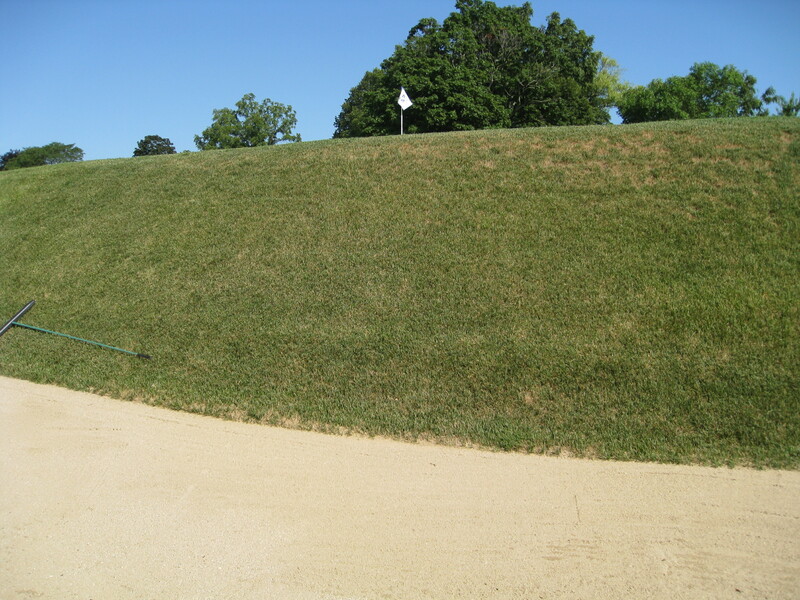 Here’s an example of the bunker, this one on the first hole. This is a pretty standard greenside bunker. If you miss greens, you are going to have work to do. 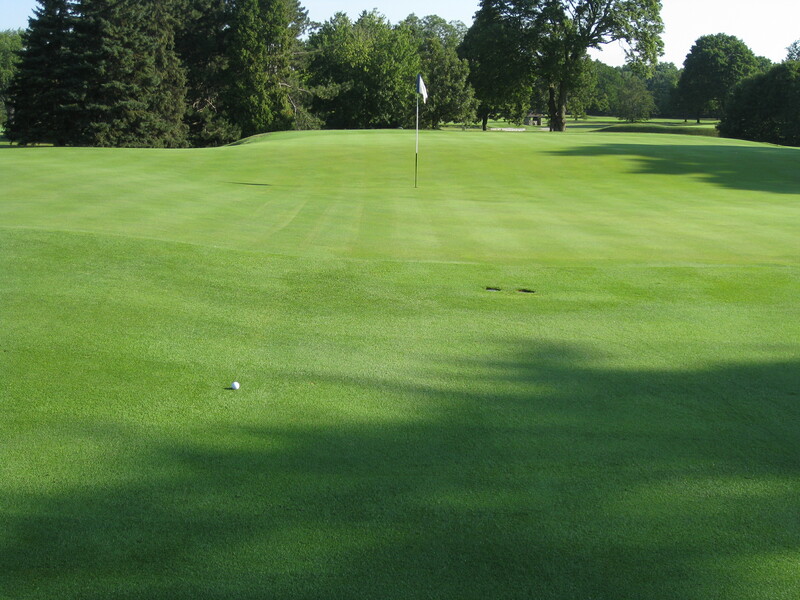 There is ton of attention paid in the GCA.com link to the greens at Blue Mound. They are really cool. One of the good ones is No. 2. This picture shows just how segmented the green is. Here are some of the cool holes at Blue Mound. Here is a shot from the landing area on No. 6, a 335 yard short par four. I hit hybrid to here. I have no idea what the good ams will hit off of the tee here. I don’t know that I see a lot of reason to hit driver. I’d hit something to a good number and try to hit it close and make birdie. Will be interesting to see whether this is a short hole that plays sneaky hard. Here is a picture of the pretty darn good redan No. 13. It is 185 from the back tees and 178 from the white tees. There is a really nice kick bank short and right of the green that will bounce balls onto the green. I, obviously, overcooked one here into the bunker — pretty much exactly where you don’t want to be. Summary: As someone who believes that fun is good more than hard is good, I love Blue Mound. 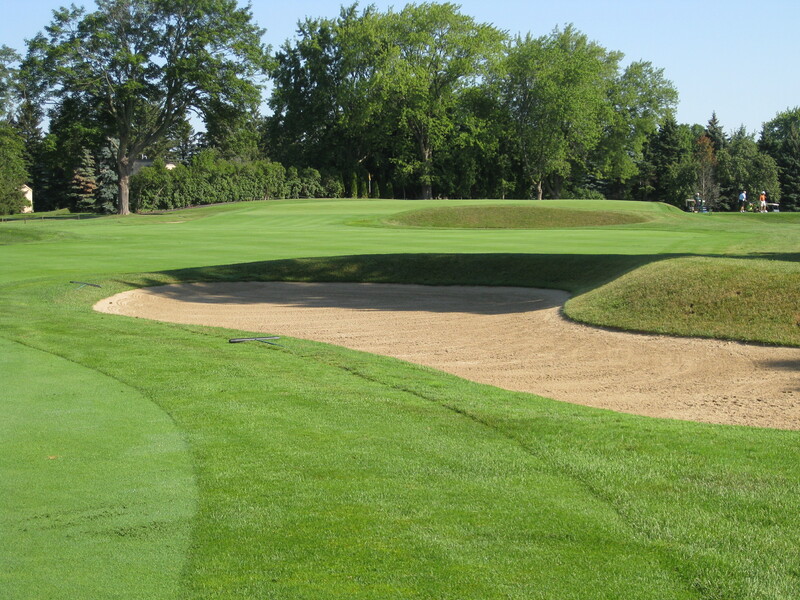 There are many cross bunkers that jut into the fairway and make you think where you should hit the ball off of the tee. The green complexes are interesting with cool bunkering. If you are loose with your approach shots, you better have a good short game. This is not a golf course that is going to beat you into submission, but it is a place where you can make a whole bunch of bogeys in a big hurry. I think it is a very good Raynor that has been well taken care of. I think it is a better course than any of the three Raynors in the Twin Cities (Somerset, Minnesota Valley and Midland Hills). It is just a great time. Will any of the amateurs go really low over the next couple of days? Considering Billy Horschel shot 60 at Chaska Town Course in the stroke play portion of the ’06 Am, I would guess somebody will go low and flirt with 60. Pretty much every player in the field will get to the 497-yard No. 5 in two. And I don’t think many of them will be all that scared of the 560-yard finisher. But regardless of the scores that are shot, this is a wonderful course for normal golfers. It’s great fun and I was happy to get out there last month. Fun post. The course looks like a wonderful place to be a member. Love the redan! I hope to see the original in late May next year.